First published in the Westmorland Gazette in the 1950's, Alfred Wainwright's Pictorial Guide to the Lakeland Fells comprises seven volumes listing 214 mountains and tops - each with its own chapter. 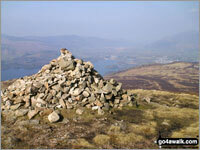 It is an ambition of many people to reach the summit of all 214 of these lakeland fells. And why not? Walking to the summit of 214 of these 'Wainwrights' is well within the capabilities of any reasonably fit walker - but how do you go about tackling this ambitious task? Each chapter in Wainwright's books is devoted to a single fell and the chapters are in alphabetical order rather than neighbouring fell order. Furthermore, the information contained with each Pictorial Guide is now over 40 years old and long out-of-date. What you need is a series of circular walks that connect all 214 Wainwrights together in a series of 59 day walks that includes all the latest route information but that are not exhaustingly long so anyone can complete them and enjoy the experience. Using our experience and intimate knowledge of the Lake District we have put together a series of 59 day walks that are well within the capabilities of any average fell walker that not only visit all 214 of the fells identified by Alfred Wainwright in his Pictorial Guide to the Lakeland Fells but also visits some of the loveliest valleys, passes and ridges in the The Lake District. Choosing the most appropriate routes was surprisingly difficult and took a great deal of time and effort to achieve. But the overriding emphasis is on the quality of each of the 59 walks we have chosen to ensure that you'll get the true flavour of the Lake District from every angle, every corner and every view point. The hardest walk in this collection is 12½ miles long and you can complete them all without any special equipment or knowledge. All you need is some good quality walking boots and clothing, food and water, accurate & up-to-date route instructions and the desire and stamina to do something truly memorable. Furthermore, using our professionally produced walk routes, you can Walk the Wainwrights and avoid the potentially vertigo inducing arétes of Sharp Edge and Striding Edge if you want to. Included in our series of 59 Walk the Wainwrights walks are routes of varying length and grades - from a 3 hour, 5½ miles, Grade 4 walk (the shortest walk) that you can easily do during the winter to 8½ hour, 12½ miles Grade 8 walks (the hardest walks) to enjoy on long summer days. 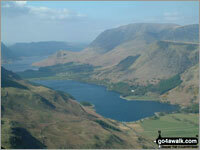 As you climb, bag & conquer each Wainwright you can record you achievement via your go4awalk.com Personal Mountain & Hill Bagging Record (PMBR) and view your progress on a series of interactive maps. Furthermore, since you can also access your Personal Mountain & Hill Bagging Record via go4awalk Mobile you can quickly & easily record, edit and view your achievements - whether you are at home/work on your desktop computer or in the pub/at the top of a mountain with your Smart Phone. You do not need GPS to walk the Wainwrights - but if you prefer the added security a GPS device brings you then each of these 59 Walk the Wainwrights walks has an accompanying GPS Waypoint data file you can download to your computer and then upload to your hand held GPS Device. The relevant GPS waypoints are also printed on each walk route if you prefer to input them by hand when you are already 'on-the-hill'. Indeed, if you are really dedicated - you could easily complete all 59 Walk the Wainwrights walks in a single year - something very few people manage and an achievement to be truly proud of. We also have available a series of Seven Area Maps showing the locations of all 214 Wainwright fells with an outline of the 59 Walk the Wainwrights walks. Using these you can easily see where each walk goes and which Wainwright each walk 'bags' so you can chart your progress and plan your next walk with ease. Of course it is perfectly possible to bag all the Wainwrights in less walks than the 59 walk that we have chosen - but this would involve tackling longer walks (or route marches) for which you would need to be pretty fit and keep your head down. And that would be a real shame because the 59 Walk the Wainwrights walks we have selected visit some of the truly loveliest spots in the Lake District. Places where you should take time to linger and take in the stunning scenery. Places where perhaps you will get a little insight into what drew Alfred Wainwright himself to the area over and over again. *Our 'Walk the Wainwrights - The Central Fells' planning map - along with over 50 sample walks and GPS Waypoint data files - is available FREE from a link in the current issue of our monthly Newsletter. *To download the 59 walks that visit all 214 Wainwrights you will need just one 50 (+50 FREE) Walks/Credit go4awalk.com Account (1 Credit to view the list of 59 walks, 7 Credits for the 7 Wainwright Peak Bagging Maps and 59 credits for the 59 Walks).